2011 McLaren AUTOSPORT BRDC Award winner Oliver Rowland completed his prize test in McLaren's 2011 MP4-26 car at Silverstone today. The 20-year-old Briton, a race winner in this year's Formula Renault 2.0 Eurocup, completed three separate three-lap runs on a sodden track. 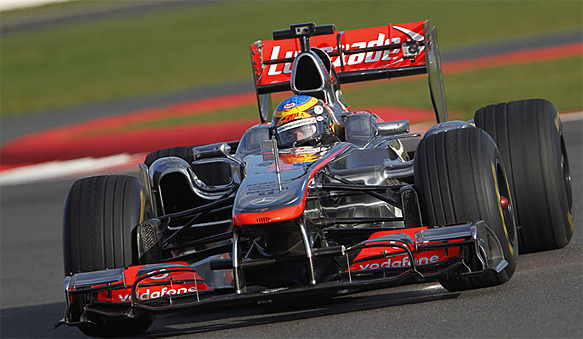 He was driving chassis #2, as used by both Lewis Hamilton and Jenson Button during their respective 2011 campaigns. "It was unbelievable," Rowland said of his first taste of F1. "I have even more respect for the F1 guys now. "It wasn't physically as difficult as I thought it might be - it's the power. When I put my foot down coming out the pits it was like 'oh my god.'" This year's six finalists - Formula Renault NEC frontrunners Jake Dennis, Josh Hill and Jordan King, Star Mazda driver Jack Hawksworth, Formula Renault Eurocup podium finisher Melville McKee, and Formula Renault BARC runner-up Josh Webster - were all present to watch Rowland. The six had just finished their own assessments at the British circuit, in front of a panel which included ex-Formula 1 racer and BRDC president Derek Warwick and McLaren head of vehicle engineering Mark Williams. This year's winner will be revealed at the AUTOSPORT Awards in London in December. Former winners of the award, which aims to promote young British racing talent, include 2009 F1 world champion Jenson Button, 13-time grand prix winner David Coulthard, sportscar racer Anthony Davidson, DTM race winner Jamie Green, and four-time IndyCar champion Dario Franchitti.